Dickens was always adapted. From the start of his brilliant career his works were pirated for the stage - often, to his annoyance, before his serial publications were even finished. The Inimitable author himself produced versions of his tales for his immensely popular reading tours. Before the Cinematograph, it was the Magic Lantern which presented the stories and characters in pictorial, sometimes even animated, form. By the time moving pictures were exhibited, even those who had never read Dickens must have been familiar with his characters. About a hundred films based on the works of Dickens were produced in the silent era - not just in Britain and the USA but throughout Europe. The first that still exists - at half of its original six minutes - is Scrooge, Or Marley's Ghost , made by the stage magician Walter Booth at the north London studios of R.W. Paul . An epic production in 1901, it made use of special effects such as superimpositions and animated title cards. Given this visual sophistication, however, the performer who plays all the ghosts clad only in a partially-covering bedsheet leaves something to be desired. Not all the one- and two-reelers from the early years were as inventive. Many of them were little more than moving illustrations, like Dotheboys Hall (d. Alf Collins, 1903). This three-minute production contained no cuts but plenty of action within the rigidly-held frame. Like one of Phiz 's illustrations come to life, it shows a sequence of events from Nicholas Nickleby, with the headmaster's wife doling out brimstone and treacle, Squeers' vicious treatment of the boys and Nicholas rescuing poor Smike. But it's hard to imagine audiences could have made much sense without prior knowledge of the story, or the help of a 'lecturer' in the auditorium. The most inventive film from this period is D.W. Griffith 's version of The Cricket on the Hearth (US, 1909) - a genuine attempt at adapting a novella into motion picture narrative. Griffith credited Dickens' works as inspiration for his pioneering film style, particularly cross-cutting from different spheres of action. The first feature-length Dickensian film was David Copperfield in 1913, hailed for its pictorial composition, with some scenes filmed in the novel's own Kentish locations. It was respectfully yet stolidly directed by the 'Dickensian character actor' Thomas Bentley for producer Cecil Hepworth , whose father had presented magic lantern shows of Dickens topography. Bentley made six silent Dickens adaptations, the most sumptuous of which must surely have been 1915's Barnaby Rudge , the biggest-budget British film of its day, now sadly missing. The surviving pressbook shows spectacular sets of 18th century London built at Walton-on-Thames. Bentley went on to make the first British Dickens sound film in 1934: The Old Curiosity Shop , praised by John Betjeman for "the best Dickensian scenes yet produced" and still memorable for Hay Petrie 's demonic depiction of the deep-dyed villain Quilp. The last silent Dickens film was an adaptation of a play based on A Tale of Two Cities directed by Herbert Wilcox in 1925. The great actor-manager John Martin Harvey had first taken the role of Sydney Carton in The Only Way in 1899, but found no difficulty in reprising his performance for the screen when he was a sprightly 62 year-old. Great versions of the 1930s came from Hollywood studios, with David O. Selznick 's productions of David Copperfield and A Tale of Two Cities (both US, 1935) proving adaptations of literary classics could be box-office triumphs as well as prestige productions. But it is six postwar British films that remain the benchmark by which to judge Dickensian adaptations. This cycle of British films coincided with a critical re-evaluation of Dickens the writer. Rejecting those highbrow literary types who saw his work as vulgar and melodramatic, critics including George Orwell and Soviet filmmaker Sergei Eisenstein praised the author's psychological insights and his moral and comic vision, and even suggested that his prose style anticipated cinematic narrative. 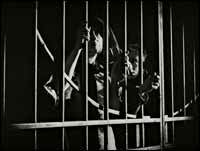 From its atmospheric opening, in which the young Pip is surprised by the escaped convict Magwitch, Great Expectations (1946) shows the supreme confidence of its director, David Lean . Lean had become interested in Dickens's masterpiece after seeing a stage version written by a relatively unknown actor: Alec Guinness . Great Expectations provided Guinness with the first role in his distinguished film career, but it is John Mills who stars as the grown-up Pip, tearing down the dusty curtains of a ruined old mansion to let light flood in, in a climactic scene which somehow reflected the optimism of a British populace eager for change. However, two years later Lean 's Oliver Twist was an altogether darker proposition. Now widely considered the greatest of all Dickens films, on its release it was the subject of bitter controversy. Full-scale rioting occurred in a Berlin cinema and the film was banned in the USA for several years, only finally shown with cuts. Why? Because Alec Guinness 's depiction of 'the Jew' Fagin, modelled precisely on the original illustrations by George Cruickshank , was accused of being anti-Semitic. This was perhaps inevitable so soon after the revelations of the holocaust, and its horrific illustration of where racial stereotypes can lead. The undisputed success of these two Cineguild films has somewhat overshadowed a film which came in between: Nicholas Nickleby (1947), directed by Cavalcanti for Ealing Studios . This 'Ealing noir' tells the story of a young man's progress in a brutal, heartless world pervaded by an atmosphere of chill menace, presided over by the brooding, villainous presence of Cedric Hardwicke . But light finally triumphs over darkness and consideration for others less fortunate wins out over self-serving avarice. Another metaphor for postwar Britain? The time is surely right for a re-evaluation of this unjustly neglected film. Two lighter, well-loved films from equally well-loved books followed. The Pickwick Papers (d. Noel Langley, 1952), is a good-natured romp which at times almost captures the shambolic anarchy of the brilliant original, ranging from the slapstick of men behaving badly to the descent into purgatory of Pickwick's incarceration in the debtor's prison. Among the galaxy of character actors - including Joyce Grenfell , Hermione Gingold and Donald Wolfit - there is a poignant cameo by George Robey , connecting the film back to the comedy of the music hall. And in Brian Desmond Hurst 's Scrooge (1951) Alastair Sim created the definitive portrayal of the eponymous miser. Is it possible to imagine a richer performance of the erstwhile money-lover's reformation on Christmas Day? The final film in this loose cycle was Rank 's A Tale of Two Cities (d. Ralph Thomas, 1958). The task of adapting this notoriously difficult story was given to T.E.B. Clarke , best remembered as a writer of Ealing comedies. The role of Sydney Carton, the drunken lawyer who becomes a self-sacrificing melodramatic hero, was played by Dirk Bogarde at the height of his matinee-idol fame, approaching but never surpassing the glorious performance of Ronald Colman in the 30s. Together these films established Dickens as central to the very notion of 'English heritage' while proving that his themes remain timely, continually reinterpretable for cinematic adaptation in any age. There were no further feature-films versions for a decade, because Dickens adaptations had migrated to television. TV's episodic treatment more closely paralleled the serial publication of the originals and the greater length meant that later, more complex books could be taken on. In the 60s and early 70s Dickens' best-loved tales would have a new incarnation: Musicals! 1968 saw the cinema release of Oliver! Lionel Bart 's nostalgic, exuberant evocation of an 1830s which possibly has more in common with the vanishing East End of his childhood and the contemporary Swinging London. Dickens lovers argue about the merits of Bart 's show and the film based upon it. But who could forget Ron Moody 's seductive performance as a benign Fagin? And has there ever been a scarier Bill Sikes than Oliver Reed ( Robert Newton notwithstanding)? Oliver! was the last great film to be directed by Carol Reed , the illegitimate son of the actor Herbert Beerbohm Tree who'd had a long-standing success playing Fagin on the Edwardian stage. This play was eagerly gobbled-up by one cockney street-kid who regularly forewent his supper in order to afford a sixpenny ticket in the gods. Later, during the First World War when in Hollywood, Tree reprised his role for one night only as a benefit for the Red Cross. This time his erstwhile young fan played with him in the role of the Artful Dodger: Charlie Chaplin . By now he was a world-wide phenomenon, proclaiming throughout his life that Dickens, and Oliver Twist in particular, was a major influence - hardly surprising considering his own poverty-stricken early London life. Other stage musical versions followed in the wake of the success of Oliver! - but perhaps it's best to draw down the curtain on Pickwick (with Harry Secombe on stage), Scrooge (d. Ronald Neame, 1970, with Albert Finney ) and Mister Quilp (d. Michael Tuchner, 1975, with Anthony Newley ). An idiosyncratic pair of features seemed to come from nowhere in 1987 - actually emanating from Sands Films , based in a very Dickensian location on the River Thames. Christine Edzard split Little Dorrit into two separate but over-lapping films: 'Little Dorrit' and 'Nobody's Fault' . Once again many great performers were out on parade, notably (now Sir) Alec Guinness gave his the last Dickensian role in an unforgettable performance as the Father of the Marshalsea. In the 21st century Dickens film adaptations have continued unabated, despite increasingly sophisticated and budgetary lavish TV co-productions. Roman Polanski 's own early life as a Jewish boy on the run from the Warsaw ghetto meant that Oliver Twist has also been an important tale for him, which he finally transferred to the screen in 2005, with Ben Kingsley giving yet another fine interpretation of Fagin, including scenes and aspects of the character never before put onto screen. And, however technologically advanced the 3-D animation of the 2009 Disney A Christmas Carol , with Jim Carrey as Scrooge, it remains reminiscent of that R.W. Paul / Walter Booth 1901 spectacle... which is where this story began. Unsurprisingly, more pre-sold Dickens-sourced material is in production for the bicentenary year of his birth 2012 If, perish the thought, his works were never to be read again, will his appeal remain secure only because of these film and television versions emanating from his unique imagination? That would be a shame. For have any of these adaptations - even the finest - ever managed to truly translate the fullness of the fantastic fancy of our greatest story-teller?